게시판 > News in Brief > [CSW60] Parallel Event on March 17, "Transforming Society through Women's Empowerment"
[CSW60] Parallel Event on March 17, "Transforming Society through Women's Empowerment"
It was truly an honor and pleasure to moderate a substantive and thought-provoking parallel event hosted by the ICW, Transforming Society Through Women’s Empowerment that took place on 17 March 2016 from 12:30-2:00 pm at the Chapel in Church Center. 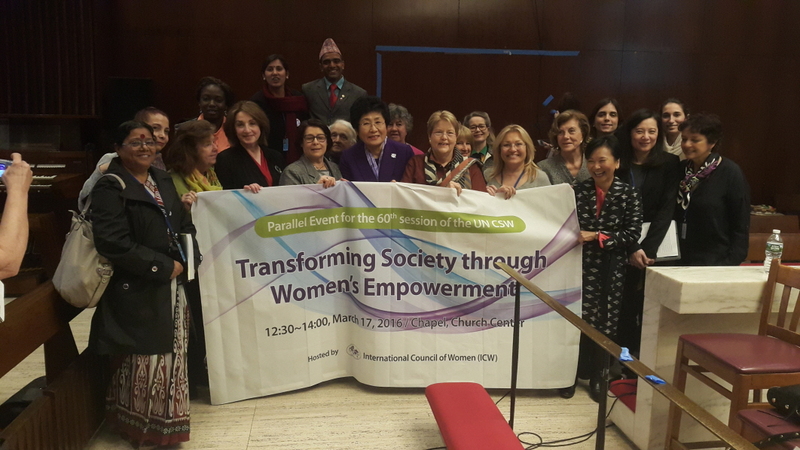 The high caliber speakers on a topic on point with the priority theme of CSW 60 attracted more people than the pews could accommodate and captivated the standing room audience until the end of the event. Welcoming the speakers and participants, ICW President, Dr. Kim inspired the audience with her vision of the kind of transformation in society that can be achieved through the political, economic and social empowerment of women. She underscored that ordinary change is not enough, the transformation must be “a deep change, with emphasis on personal, organizational and social systemic change.” Explaining that women use power to transform the agenda, values, processes and institutions as well as to develop people and communities, she called for achieving transformation that is development-oriented, gender responsive, and promotes gender equality across all sectors to create a better world for our next generation. She called on women to embody the change they want to see in the world, emphasizing that “Transforming a society starts with transforming women through women’s empowerment.” Linda Liu, Vice President of ICW, introduced the outstanding slate of speakers, starting with Dr. Lakshmi Puri, Deputy Executive Director of UN Women, followed by Dr. Charlotte Bunch, a renowned women’s activist and founding director of the Center for Women’s Global Leadership at Rutgers University, Dr Soon-Young Yoon, the past chair of NGO/CSW and 1stVice President of CoNGO, and Dr. Veronica Magar, a Team Leader of Gender, Equity and Human Rights of WHO. Each of the speakers further developed the theme along their expertise, with Dr. Puri emphasizing the pivotal role of political empowerment of women in transforming society as well as the symbiotic relationship between economic and political empowerment of women. Echoing Dr. Kim’s idea of deep inclusive transformation, she emphasized the UN’s HeForShe campaign to engage men in the movement to achieve a 50-50 world and No One Left Behind campaign to promote transformation that leads a more inclusive society. She concluded her remarks stressing the need for the UN to transform the way in which it collaborates with civil society. Dr. Charlotte Bunch focused the impact of women’s political participation on the enhancement of women’s rights, social protection infrastructure, and the provision of health, education, childcare and greater social services. She also emphasized that economic empowerment is the key to women’s participation in politics, control over their lives and ability to transform society. Dr. Bunch concluded by stressing the important role civil society can and should play to effect social transformation. Focusing her talk on violence against women, Dr. Yoon recounted a moving story of a young woman from Egypt who had the courage to become an activist for women’s rights after suffering domestic violence, She spoke of the need to design new strategies to prevent violence against women, such as changing the focus of advocacy on economic costs of violence and implementing programs to prevent men and boys from engaging in violence. She pointed out the need to gather more data on interventions to help us better understand what policies are effective to break the cycle of violence. Dr. Magar closed the conversation by weaving the symbiotic relationship between women’s health and their empowerment. She further stressed the need to provide women with better medical and health care to cure communicable diseases so that they are able to live equally in good health. During the Q&A, many questions were raised on how the UN can help to ensure that countries will have more future women leaders, how to identify and ensure what needs to be transformed, as well as suggestions on how to engage more men in the movement. The panelists suggested that laws, political will, movement building, 50-50 male participation and youth engagement in the achievement of gender equality and women’s empowerment are methods to change the mindset and advance the agenda. Many people lingered to speak more with the excellent panelists, reluctantly clearing the room when people arrived for the next event.